After bank accounts and mobile numbers, it looks like Aadhaar verification is making its way to social media via Facebook. While this is not yet confirmed, there are reports of Facebook prompting new users to enter their names as per their Aadhaar Card. While the UID or the Aadhaar card is being linked to banks and mobile number, it does not sound far-fetched when talking about social media linking. This was first spotted by a Reddit user who wanted to Sign up on Facebook. Link your Aadhaar Card to Facebook? Since Aadhar card linking is becoming necessary for more and more services, there is a possibility of this coming to social media platforms also. 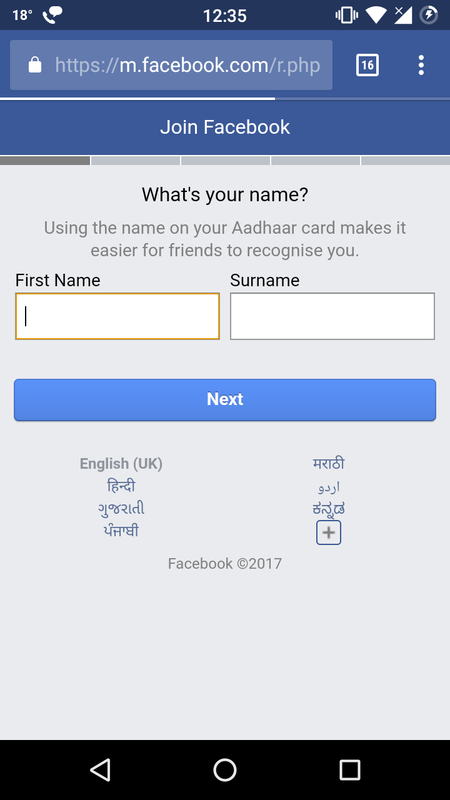 Facebook is prompting new users to use the name as mentioned on their Aadhaar cards. The prompt asking users to use the same name as their Aadhaar card is not showing all the time but appearing at random attempts, as reported by the users. Also, this is not a far-fetched conclusion to say that Facebook can use Aadhaar verification to get rid of fake profiles. Linking Aadhaar cards or any other identification proof to Facebook can yield good results. One of the key benefits will be the eradication of fake profiles from Facebook. Also, a blue badge from the social media platform could result in more credible profiles as they will be verified with a proper ID proof.